ARABIAN GULF- (September 16th, 2015) – A carefully-placed white porcelain plate sits neatly arranged on top of crisp blue linen spread sharply across a table, forming the foundation of an affair that has become more than just a dinner, it has become an experience. Steam rises quickly around piping hot chafing pans full of food which are the bridge bringing together two cultures in the spirit of fellowship. These are the hallmarks of a successful reception, and when it’s done well, it looks effortless, so the guests would never have an idea of the days spent to ensure success. 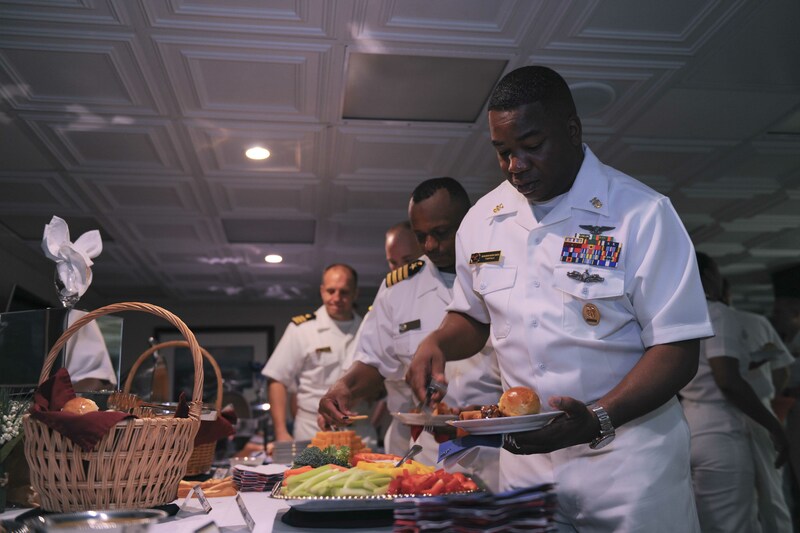 “It takes a lot of experience, a lot of exposure and having a vision of how a great reception should look like, and my guys have a lot of experience in that,” said Chief Warrant Officer Benny Brockington, food service officer for TR. 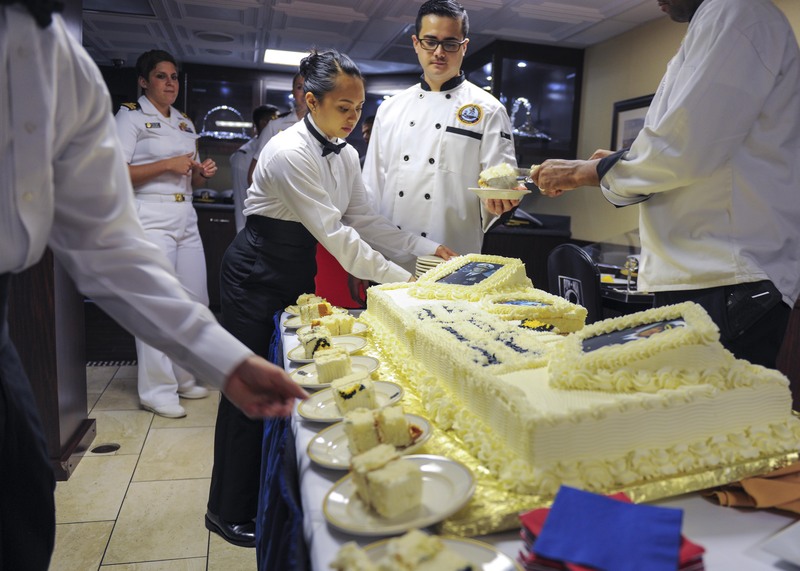 Receptions like the 5th fleet change of command don’t just happen on a whim. It takes weeks of planning and research in order to put together a unique and enjoyable experience. 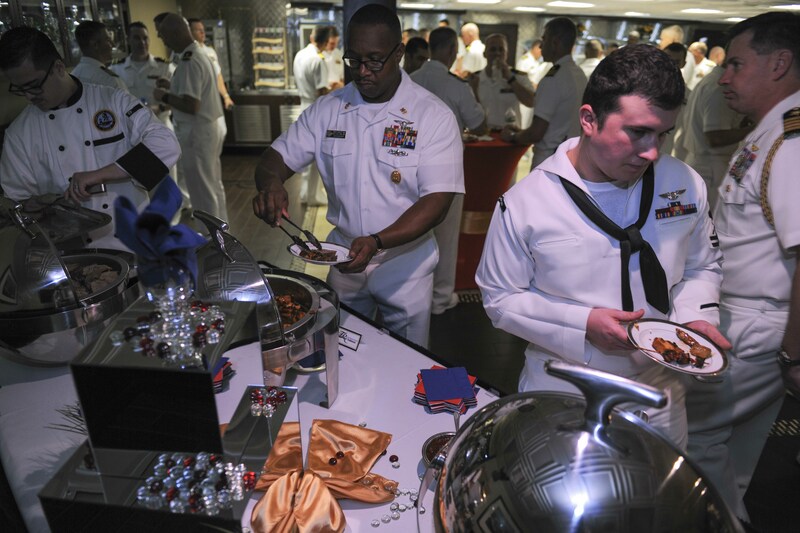 “If you look at the event in Bahrain, the planning for that started right after we did the TR’s change of command because 5th fleet’s Vice Adm. Miller was in attendance, and from that very day, they were looking for us to work the reception. So we had a lot of meetings in order to track everything along the way to make sure we had everything. You have to make sure you have all of your equipment and all of your linen because when you’re doing something like this, it has to look real good. Then you have to draft up a menu, which gets sent off for approval and once you get it back you have to start looking at recipes. In this case we had local recipes that we don’t usually use in the navy so we had to create them. “said Brockington. Once the menu has been finalized, food for the reception has to be ordered. Though it may seem simple, this is a monumental task that is placed in the care of Senior Chief Culinary Specialist Will Pearson of the S-2 Cargo team. “First thing we want to know is how many people are going to be there because at the same time we have to feed the crew and we have to have enough stores for the next underway period, which can become a headache. Everybody depends on us not to drop the ball, so we have to be prepared for anything. Maintaining space can be a headache even when we get a RAS before pulling into port. With not a lot of people eating on the ship, it’s basically a hit or miss when it comes to ordering. We fight so hard to be successful for the crew because we don’t want to fail anybody,” said Pearson. Usually each customer will order from what’s available in the ships catalog but if there’s anything that isn’t in stock, Pearson will have to go out in town and purchase it. “Things like the ice sculptures, we had to get a vendor out of a local hotel that had an ice carver,” said Pearson, who continued by saying he had to have his people go to the commissary make a few purchases to complete the evening’s menu. In order to ensure success for an official reception, all hands have to provide support. Chief Culinary Specialist Karen Thompson, Mini Chow Boss on board TR. Every reception is its own unique experience, and Thompson believes it requires a certain attitude to pull off a successful event. 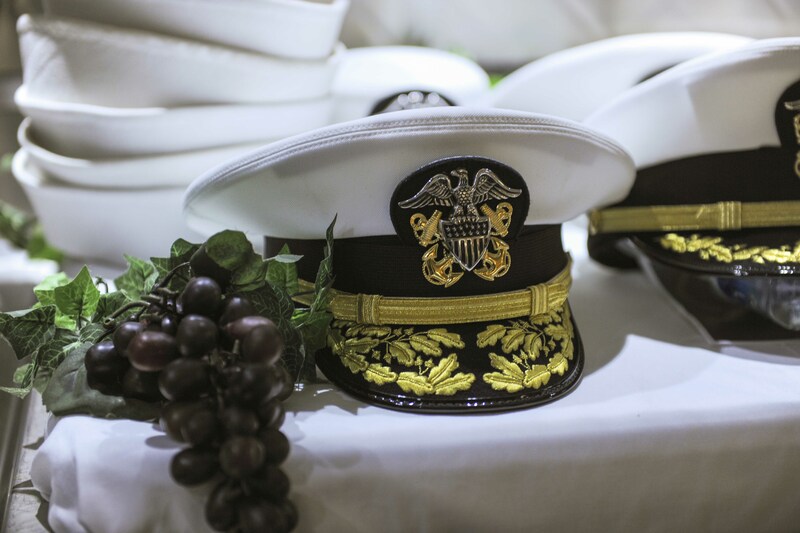 These functions are more than just changes of command or receptions. The impressions guests have after attending these function can have a far-reaching effect on how the local community views the ship. “It’s important for us to have a great image because the whole purpose of having receptions is to promote good relations with the country that we’re in. When we put on a good show, they tend to love it, and it makes our relationships a lot better.”said Pearson. “It puts your image out there so every time we do something, we become a reflection of the TR and we don’t want to be an embarrassment to the team.” said Brockington. Though Brockington has been a part of countless receptions during his career, it is still an honor for him to put on these grand events because of the respect and opportunities it brings to TR.